Did you miss any of the Coding Tips we offer in The Monday Fix, our weekly email? Here’s an index alphabetized by coding subject to help you locate a previously published newsletter. Click on the article you’d like to read to see a copy of that week’s newsletter. Not a subscriber? 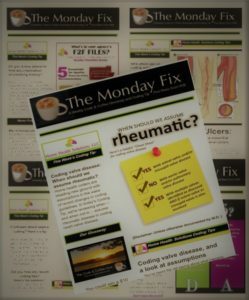 Click here to sign up for The Monday Fix,. April 3 2017 – Wondering whether to round up? March 27 2017 – Are lab results a confirmed diagnosis? July 25 2016 — Do your OASIS scores add up to what’s really going on? Jan. 23 2017 — Severe sepsis, septic shock and post-procedural sepsis. May 30 – Is it a laceration? Dysphagia occurs when a patient has difficulty swallowing due to nerve or muscle problems in the throat or esophagus resulting from a stroke, gastroesophageal reflux disease (GERD), cancer of the throat or mouth and certain neurological disorders. This condition is identified in Section R13, “Aphagia and Dysphagia,”of the ICD-10 classification set. But it isn’t enough for coders simply to report that a patient has unspecified dysphagia, R13.10. Even with documentation specifying the phase of dysphagia which must be coded, this particular condition can create stumbling blocks to trip an unwary coder, so tread carefully. Category R13.1 has a Type 1 Exclusion that can create issues. Exclusions are codes that should never be used at the same time as this code. Tip: Be sure to review category R13.1’s exclusion before using this code for reimbursement purposes. When the supply of blood to an area of the body is not sufficient, the result is a shortage of oxygen and glucose needed for cellular metabolism. The medical term for this condition is ischemia. The blood flow problem may be due to narrowing of the arteries by spasm or disease – or by some other form of arterial obstruction, such as pressure or trauma. Some serious health risks, including stroke, are associated with insufficient blood supply, depending upon where in the body the blood flow is restricted. When blood does not flow adequately to the capillary beds of the lower extremities, one of the most painful results may be an ischemic, or arterial, ulcer. These ulcers typically present on the lower leg or foot, particularly on the sides of the foot or the tips of a patient’s toes, where there is inadequate perfusion of skin and subcutaneous tissue. Clinicians generally recognize arterial ulcers by their “punched out” appearance. They are full thickness wounds with smooth edges. The appearance of the ulcer with regard to shearing and stretching of the tissue, whether dead tissue is sloughing off or whether there is eschar, a black tissue that can create a hard shell over an ulcer, is important to properly code an arterial ulcer. This is because ICD-10 classification requires documentation of the severity of the ulcer, even in the absence of documentation from the physician. We’ll take a look at the general stages of severity later in this article. It is also important to note the underlying condition when coding arterial ulcers. Circulation problems which lead to ischemic, or arterial, ulcers may be caused by conditions such as coronary disease, artery disease, diabetes mellitus, hypertension, hyperlipidemia, Peripheral Artery Disease (PAD) or smoking. The prevalence of arterial insufficiency ulcers among people with diabetes is particularly high due to decreased blood flow caused by the thinning of arteries. A lack of sensation due to diabetic neuropathy may also contribute. Home health coders are well aware of the link between diabetes and narrowing of the arteries, and are used to combing medical records for specific documentation by the physician of the cause and effect. New coding guidance, however, has impacted the need for specific links such as “due to” in notes from the physician regarding the diagnosis of a diabetes-related condition which results in certain circulatory complications. The guidance change has left many home health coders feeling wary and uncertain as they tread this new ground. Online coding forums are filled with questions about the need to link arterial flow conditions such as Peripheral Vascular Disease with a diagnosis of Diabetes Mellitus. Based on new AHA Coding Clinic guidance for the linkage between DM and certain conditions, some arterial conditions causing blood flow restrictions in patients who also have a diagnosis of DM may now be assumed to be linked to the diabetes — even without specific documentation from the physician. The ICD-10 classification assumes the link in ICD-10 coding manuals wherever it lists subterm conditions indented beneath the word “with” alongside a diagnosis such as diabetes mellitus. For example, the physician may not have directly attributed a patient’s peripheral angiopathy without gangrene to diabetes, but if there is a diagnosis of Type 2 DM and documentation of the patient’s peripheral angiopathy, you would select the code E11.51 for Type 2 DM with diabetic peripheral angiopathy without gangrene. As with everything coded in ICD-10, great specificity is required when coding arterial ulcers and the diagnoses and conditions associated with them. Coders will need to use additional codes to identify specific ulcers. Laterality MUST be documented. Even the severity of the ulcer must be noted. Avoid using unspecified codes if at all possible. Code to the highest level of specificity. The new coding guidance referenced above actually makes this level of specificity easier to achieve in many instances because the ICD-10 classification set assumes some of the burden of properly linking diagnoses and conditions, and allows the selection of a code establishing the underlying condition as well as its manifestation. It is critically important for coders to remain diligent in carefully reading and following all guidelines as they code arterial ulcers and associated conditions. As always, proceed very carefully with attention to the directions provided in the classification set itself. Pay very close attention to details such as Excludes 1 and Excludes 2 notes, and requirements to use additional codes. Make sure to document underlying diseases as appropriate. Atherosclerosis, also known as arteriosclerosis, is a widespread accumulation of fatty deposits in the arteries that may reduce blood flow to the legs, heart or brain. It can lead to Peripheral Arterial Disease or Peripheral Vascular Disease. A fifth digit will be required when coding atherosclerosis and will indicate complications associated with atherosclerosis, such as intermittent claudication (which is pain while walking that resolves when resting), ulceration and gangrene. Typically, the primary diagnosis for a patient who has an arterial ulcer will be Peripheral Arterial Disease, or PAD. This is a circulatory in which blood cannot move freely through the patient’s arteries due to narrowing or other restriction. The occurrence of an arterial ulcer is a risk factor for PAD. This disease is common among heavy smokers, diabetics and the elderly. It can lead to claudication, pain at rest and gangrene, in addition to localized ulceration. Pain while walking is the most common presenting complaint and can indicate intermittent claudication.Determining the severity of an ulcerOne of the ways in which ICD-10 differs from ICD-9 is that is requires clinicians to determine, in the absence of physician documentation, the SEVERITY of an arterial ulcer. Did you know that heart failure with “reduced ejection fraction” or “preserved ejection fraction” can be coded without further specification by the attending physician? In addition, certain abbreviations will be accepted as documentation. The Coding Clinic has reversed its previous advice on the need for specification after reviewing information from the American Cardiology Association. Please note that the terms “acute” or “chronic” will still need to be present somewhere in the chart. Specifically, terms such as heart failure “with preserved systolic function” or “reduced systolic function” can now be assigned without further clarification from the physician. Additionally, the abbreviations “HFpEF” and “HFrEF” will be accepted as documentation specifying heart failure. Many common home health diagnoses such as COPD, HTN, CAD and CVA require an additional code to indicate tobacco dependence, exposure to secondhand smoke and history of tobacco use. But do you know where to look for documentation of a history of smoking? Check in the Social History section of the M.D. notes, and chances are you’ll find it there. Nope, you think. This patient is just being treated for edema; no open wounds or lesions going on here. This particular stretch of OASIS is the equivalent of an icy road to coders; so tread carefully. M1350 is becoming notorious for the way it approaches what is and what is not considered a surgical wound, and which skin conditions it addresses. In the world of OASIS, not every evidence that a surgeon recently made an incision in a patient is considered a surgical wound. In fact, we could devote an entire Coding Tip to when a wound is not actually a surgical wound — and we may do exactly that on another Monday. But for today, let’s focus on edema, which sneaks into the list of items covered under M1350, hiding in plain sight among the ulcers, cysts, nodules, macerations, rashes and burns. So, the answer to “Does this patient have a Skin Lesion or Open Wound?” may well be YES if edema is present and has been documented. Under ICD-10, pleural effusion occurring with Congestive Heart Failure is not considered inherent to the condition and will require a separate code. Pleural effusion occurs when excess pleural fluid builds up and accumulates in the pleural lining, causing respiratory distress. While often treated in the inpatient setting, pleural effusion may also be treated in home health with interventions such as a Pleurx drainage catheter and other respiratory interventions. Home health should verify the presence or absence of a diagnosed pleural effusion to clarify a need to report the diagnosis as active in M1021/M1023. How is pleural effusion with CHF coded? — If the patient also has pleural effusion, code J91.8- pleural effusion in other conditions classified elsewhere. Three codes are required if a patient has an exacerbation of COPD and MRSA pneumonia. Consider the following scenario:Mr. Smith is hospitalized with an exacerbation of COPD and MRSA pneumonia. Notice that MRSA infection in diseases classified elsewhere B95.62 is not coded. J15.212 is a combination code which includes the type of infection and the MRSA organism. “Under dosing” is defined as using a medication less frequently than prescribed, in smaller doses, or otherwise not using the medicine as instructed. Please note that the provider must document this particular diagnosis. How it is coded depends upon whether the “under dosing” has caused a relapse or an exacerbation of the patient’s condition or created a new condition directly related to improper dosing. If the reduction in (or variation of) the prescribed dose of medication results in a relapse or an exacerbation of the medical condition for which the drug is prescribed, code the condition first. Documentation will be required for the relapse or exacerbation, but the first code used will be for the condition which first necessitated the prescribed medicine. As an example, if a patient diagnosed with COPD stops using the prescribed nebulizer, the patient may experience an exacerbation of the COPD for which the nebulizer was prescribed. Documentation from the MD must include a diagnosis of “under dosing” and must establish that the exacerbation of the COPD has occurred as a result. In this case, the correct coding sequence will begin with the code for COPD. If the reduction in (or variation of) the prescribed dose of medication triggers a different or related condition, however, the new condition will be coded first. Please note that documentation will be required for both “under dosing” and the new condition. As an example, a COPD patient who has been prescribed prednisone and abruptly stops taking it may experience secondary adrenal deficiency. Documentation from the MD must include a diagnosis of “under dosing” and link it directly to the new condition. In this case, the correct coding sequence will begin with the code for secondary adrendal deficiency. Note that in either case, documentation from the physician will be required to establish the “under dosing” diagnosis, and to attribute either the relapse/exacerbation or the new condition to that diagnosis. — And, thirdly, the Z code for “under dosing” (reason and whether intentional or unintentional) to indicate intent. Are you coding blisters incorrectly? Currently, the coding tip under L98.8 in the Decision Health coding manual tells you blisters due to edema code there. However, it has been confirmed that this coding tip was brought over from the ICD-9-CM manual in error due to mapping issues. The coding tip will be moved to its correct place, R23.8, at next printing. Do you have your blinders on? You’ll need them, to stay focused on the physician’s notes in front of you and avoid getting distracted by someone else’s coding. When coding for home health, you’ll need to completely disregard all codes provided by any facilities where the patient may have been treated. Your ONLY consideration in determining the correct code MUST be written information from the MD. If, for example, the Skilled Nursing Facility where the patient was treated has selected E11.9 as the code, but documentation from the MD during the patient’s hospitalization stay establishes that the patient has peripheal neuropathy due to diabetes, E11.9 would not be the accurate code. Based on the MD’s written description of peripheal neuropathy due to diabetes, the correct code would be E11.42. Written notes from the MD always supercede any code selected by any facility. You will need to completely disregard codes from wound care centers or clinics as well. Remember, only the written information from the MD may be used in determining the accurate code.